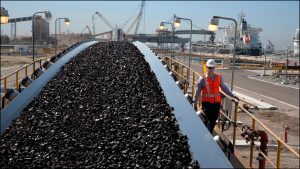 The three groups are petroleum and petroleum products, up 1,711 carloads, to 11,610; nonmetallic minerals, up 493 carloads, to 36,059; and motor vehicles and parts, up 434 carloads, to 17,557. 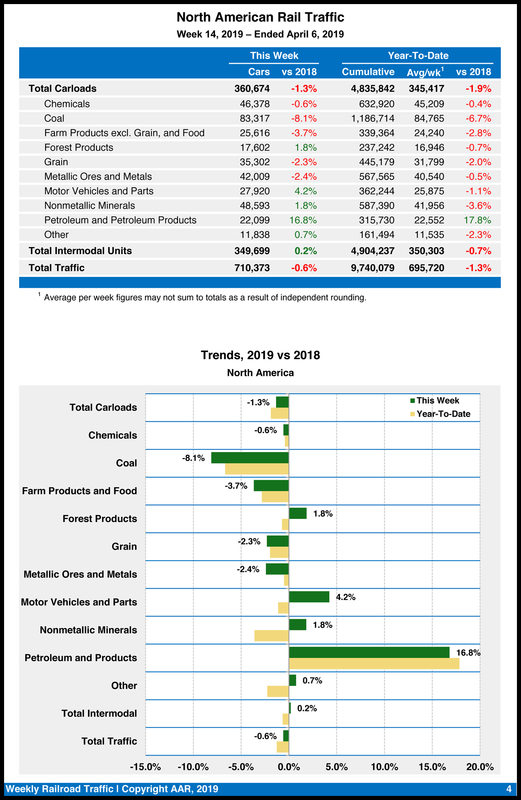 Commodity groups that posted decreases compared with the same week in 2018 included coal, down 6,417 carloads, to 75,048; grain, down 3,525 carloads, to 21,815; and chemicals, down 1,347 carloads, to 32,358. Total U.S. weekly rail traffic was 510,192 carloads and intermodal units, down 2.8% compared with the same week last year. 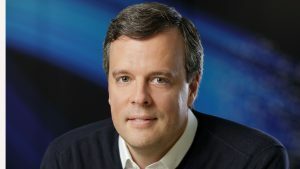 Total carloads were 251,417 carloads, down 3.9% compared with the same week in 2018, while U.S. weekly intermodal volume was 258,775 containers and trailers, down 1.6% compared to 2018. For the first 14 weeks of 2019, U.S. railroads reported cumulative volume of 3,447,026 carloads, down 3.1% from the same point last year; and 3,735,232 intermodal units, down 0.6% from last year. 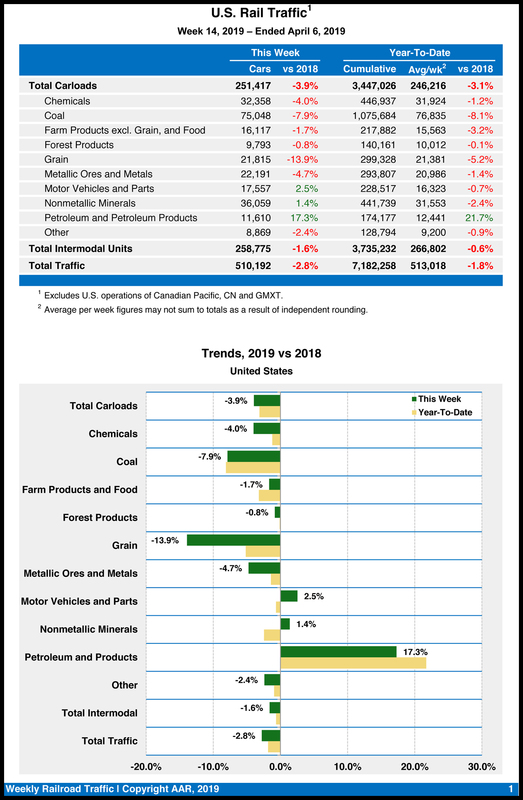 Total combined U.S. traffic for the first 14 weeks of 2019 was 7,182,258 carloads and intermodal units, a decrease of 1.8% compared to last year. 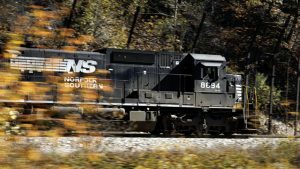 North American rail volume on 12 reporting U.S., Canadian and Mexican railroads totaled 360,674 carloads, down 1.3% compared with the same week last year, and 349,699 intermodal units, up 0.2% compared with last year. 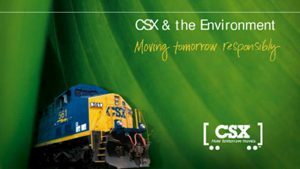 Total combined weekly rail traffic in North America was 710,373 carloads and intermodal units, down 0.6%. 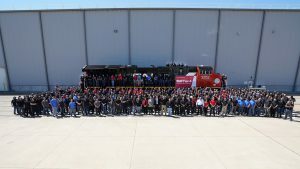 North American rail volume for the first 14 weeks of 2019 was 9,740,079 carloads and intermodal units, down 1.3% compared with 2018. 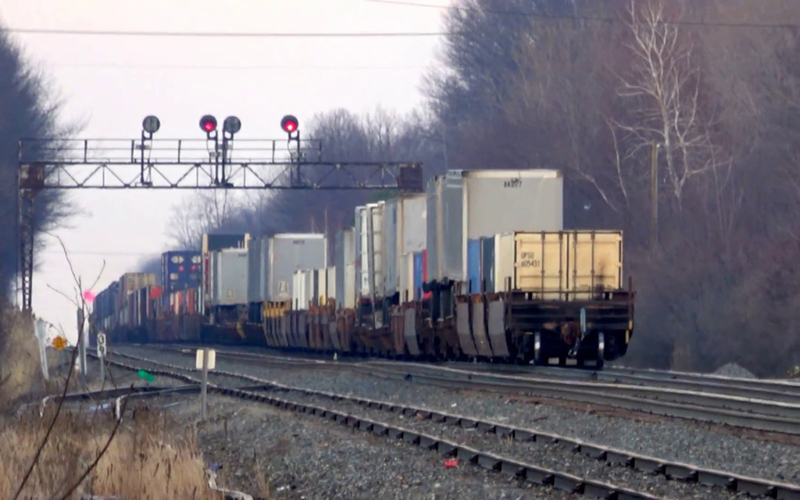 Canadian railroads reported 88,569 carloads for the week, up 6.4%, and 72,970 intermodal units, up 5.5% compared with the same week in 2018. 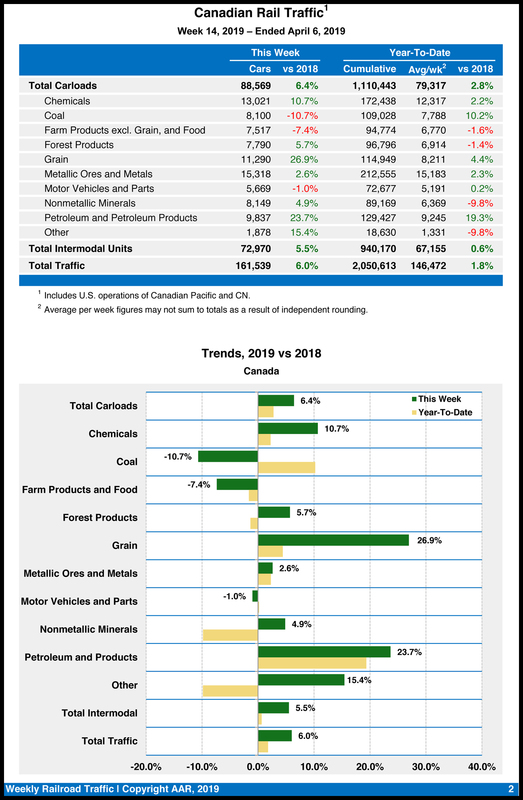 For the first 14 weeks of 2019, Canadian railroads reported cumulative rail traffic volume of 2,050,613 carloads, containers and trailers, up 1.8%. Mexican railroads reported 20,688 carloads for the week, up 0.5% compared with the same week last year, and 17,954 intermodal units, up 6.4%. 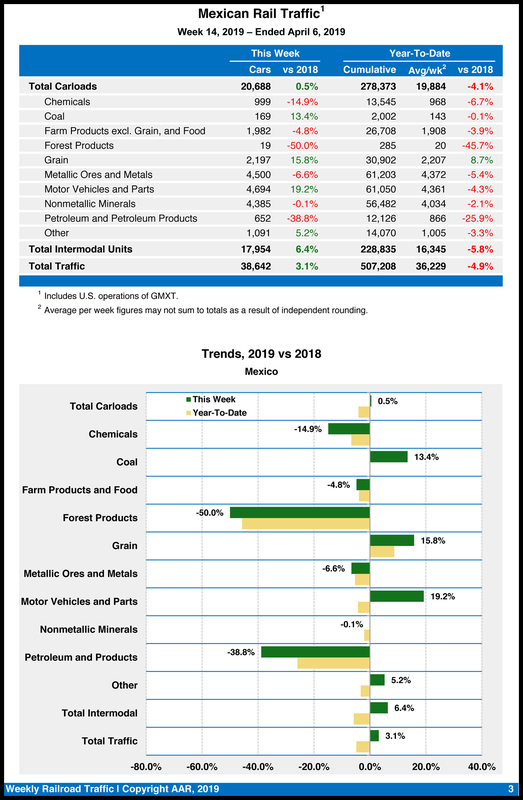 Cumulative volume on Mexican railroads for the first 14 weeks of 2019 was 507,208 carloads and intermodal containers and trailers, down 4.9% from the same point last year.